As someone who lived through 9/11 (it was the worst day of my life to date), and whose father was working in lower Manhattan that morning, I'll make this point: I would not talk about that horrific mass slaughter, or the people who perpetrated it, the way she did. Her apparent tone-deaf flippancy in both clips made me wince. If I were a public official -- especially if I were one of the highest-profile Muslims ever elected in the United States -- I honestly believe I would be doubly cautious and sensitive about how to approach these painful subjects in public remarks. That being said, I'm not as outraged by Omar's comments as others seem to be. The first clip was a parenthetical, the larger context of which was to suggest that despite the actions of a few radical Islamists, the larger Muslim community was demonized and suffered undue discrimination. Whether you agree with her point or not, that's how I interpreted what she was trying to say. The second clip struck me as uncomfortable gallows humor from a Muslim describing how other Americans discuss Islamist terror groups in a post-9/11 world. I agree that chuckling through those comments, almost like a comedy routine, feels strange and off-putting, but I don't believe she was trying to draw a moral equivalency between the United States and Al Qaeda or Hezbollah. Yes, her anti-Semitic comments and subsequent victimhood posturing call into question her good faith on these matters (as do some of her defenses this time around, which I'll address in a moment), and she has asserted things about America that suggest a grave misreading of our fundamental greatness, warts and all. It's also reasonable, I think, to point out that her throw-away euphemism about the worst-ever terrorist attack on US soil was delivered to an organization that the US government identified as an unindicted co-conspirator in a major terrorism financing case. Neither of those factors mitigate Omar's optics problem. Nevertheless, I try to be fair and honest about how I assess people's words, and I'm very much on the record as being quite suspicious of outrage mobs. If there are innocent or neutral explanations for apparently inflammatory comments in firestorms like this, I try to be open-minded to them. I don't believe that Omar is a victim of baseless attacks over the videos above, but I also think there's a difference between cringe-worthy tone-deafness and myopic insensitivity on one hand, and deliberately minimizing or dismissing the catastrophe of 9/11 on the other. In my estimation, she's guilty of the former, not the latter. Harshly criticizing elected officials over their rhetoric is also not "incitement," another stupid claim being test-driven by knee-jerk demagogues and Omar apologists like Rep. Alexandria Ocasio Cortez. It's true that Omar has received threats. That's unacceptable, and people who cross clear lines must be held accountable. But nearly everyone in public life receives threats -- including, and especially, the President of the United States. If stinging criticism of Trump amounts to "incitement," then people who've called him a traitor and even a non-human (guess who uncorked that dehumanizing slur?) should fear legal ramifications, or should at least be pressured to cease and desist with their criticisms. And if provocative political broadsides supposedly endanger people's safety, AOC should immediately delete her Twitter account. It's astounding that such an explanation is even necessary, but as Nancy Pelosi has said explicitly, Ms. Omar may not understand the meaning and gravity of words. 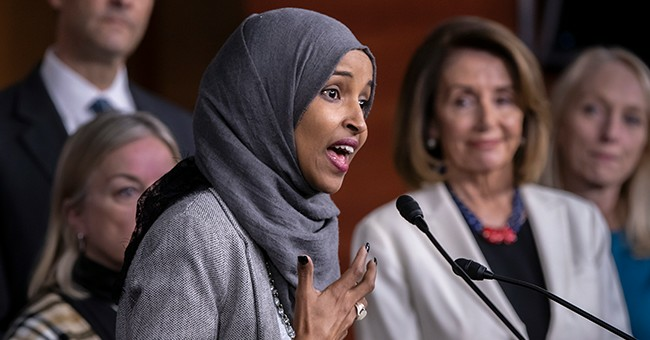 Still, Omar is a duly-elected member of Congress. She's an adult. And she's responsible for her words. In my opinion, the feeble spin and demagogic counter-attacks employed in her defense are worse than what she originally said. Sadly, I suspect she'll yet again learn all the wrong lessons from this episode, choosing to remain a victimhood-claiming lightning rod, with fellow tribal partisans all too eager to contort themselves and lash out at others on her behalf.